A very energetic storm rolled out of the mountains and spread across the prairies last night. Bobbi was driving home as the clouds thickened and the lightning began to streak across the sky. At her urging, I went out to photograph the light show and it was spectacular. The summer heat seemed to have loosened up Zeus’s arm and he was firing bolts down to the ground and between clouds for a couple of hours. This image was taken at the sports field in Redwood Meadows just a little ways from my house. The clouds were running east along the south side of the Elbow River. To the north, the sky was clear which presented an interesting background to lightning. Following a few minutes set up by the field, I went out onto the prairies after this image and had a great (although late) night storm watching. This entry was posted on July 30, 2014 by Christopher Martin. 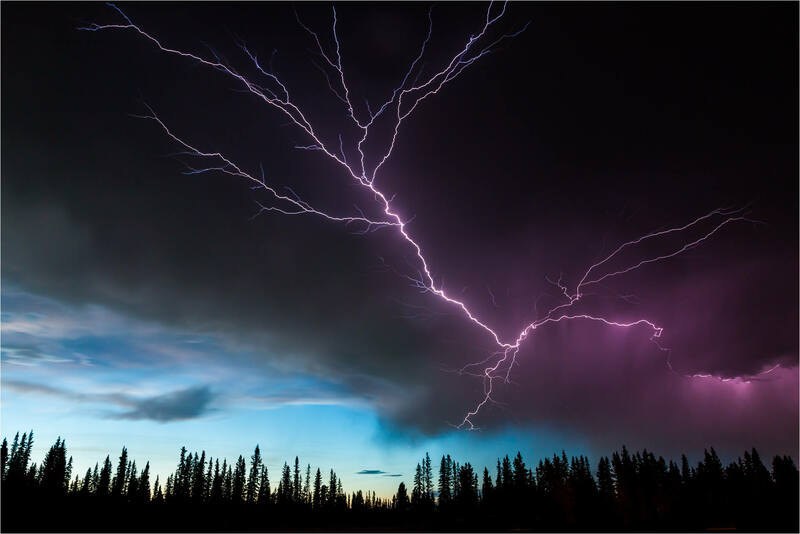 It was filed under Landscapes, Nature, Night Photography, Weather and was tagged with alberta, Canada, landscape, lightning, lightning bolts, lightning strike, nature, Redwood Meadows, storm, Weather. Luck was on my side – it started to rain really hard just after this shot. I tweeted it. Just a spectacular shot!!! That is an amazing shot,quite fascinating to see the different colours in the lightning itself. I tried to get one a few storms ago but no luck. Did you use a tripod and keep the shutter open or take a few quick ones and get the timing right? Hi – thanks for having a look. I used a tripod and a long exposure (30 seconds) for this image. It was still pretty light out so I was able to use a small aperture (f/11) without raising the ISO too high. Thank you Kathy. Have a great weekend.